“I can eat the baby”. Their equivalent of “I could eat a horse”. Except, of course, here, they do eat horse, so I suppose it’s not quite the same. This entry was posted in Italy and tagged Food, Italians, Italy by Andy. Bookmark the permalink. “i can eat the baby”??!! Oh! OK, so it’s NOT an Italian saying then? Sorry about that. She is part Swiss – do you think that might be it? I have never heard of it but it can be. 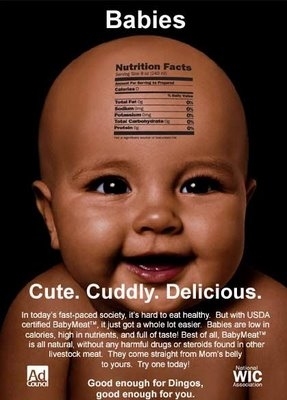 There is a popular Italian saying which refers to the fact that “communists eat babies” (!!) but it has nothing to do with the above described context. However, if she is part Swiss you have the answer already they have weird saying…!! Yes, I know the ‘communists’ one. It’s also been said about the Chinese, and the jews, and, no doubt countless others. It just shocked me – for someone to say it about themselves – even if it was only an expression as to how hungry she was!